I’ve had a nasty fever these days, which is why the release of the vivre cards has taken a bit longer than usual, so I please ask you to be a little bit more patient as I try to work on it, I hope to release it in the following days. Anyways, aside from that, I mustered the strength I had to bring you this Chapter Secrets. It took some effort, but here it is! Advanced Arm.haki is not enough to take down Kaido, even if Luffy masters this ability to the same extent as Silvers Rayleigh, it won´t be enough. Because Rayleigh used this art to hurt the elephant, the elephant was hurt. but the elephant got back up. Kaido is WAY stronger than an elephant in fact he has elephant as a sabordinate. 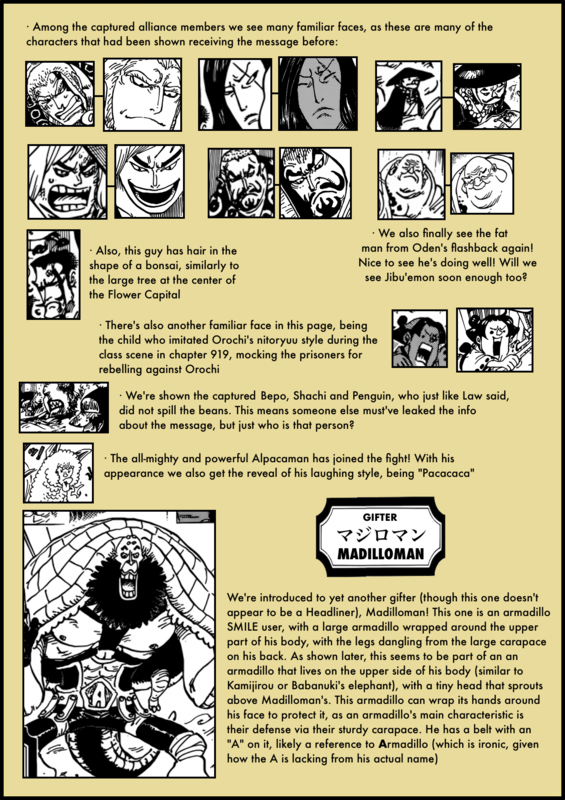 and we know the different between a yonko and his top underlings in terms of power. 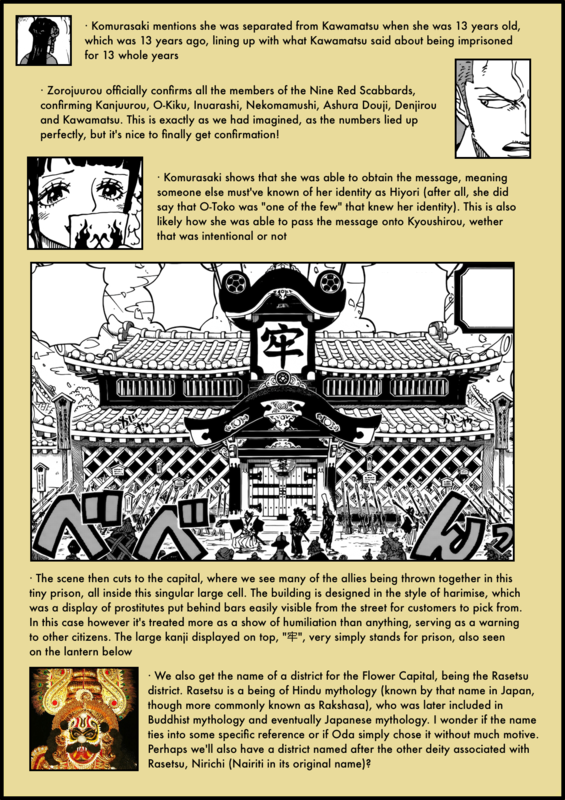 I do not know where Oda is going with this? I mean while I do agree that just advanced armament shouldn’t be enough to take down Kaido, you do have to keep in mind that Rayleigh probably did not use his full power when taking down the elephant. When Raylight showing Luffy how to use that colour of arm.haki to some innocent elephant… why would you think Raylight would use a full power attack on it…? Or you could say that Raylight’s haki and power only manage to hurt Luffy when he poke Luffy’s nose? Imagine if Raylight simply use his full power attack when poking that nose… That would be the end of OP, isn’t it? I think this advanced Armament Haki attack combined with his most powerful attacks (Leo bazooka for example) maybe can give Luffy a significant power up. Also he could attack from a distance perhaps? I wonder if Lucci’s Rokuogan was a form of this advanced armament haki. Mahbob94.. you need use brain sometimes dude, how can you compared elephant and kaido have same degree at this point ?? Maybe UR right, let see where this will be going. In my opinion Kings-haki is the answer to defeat Kaido, to be more precis, an awekening of Kings-haki. Big Mom is an awekened Kings-haki user in my opinion. 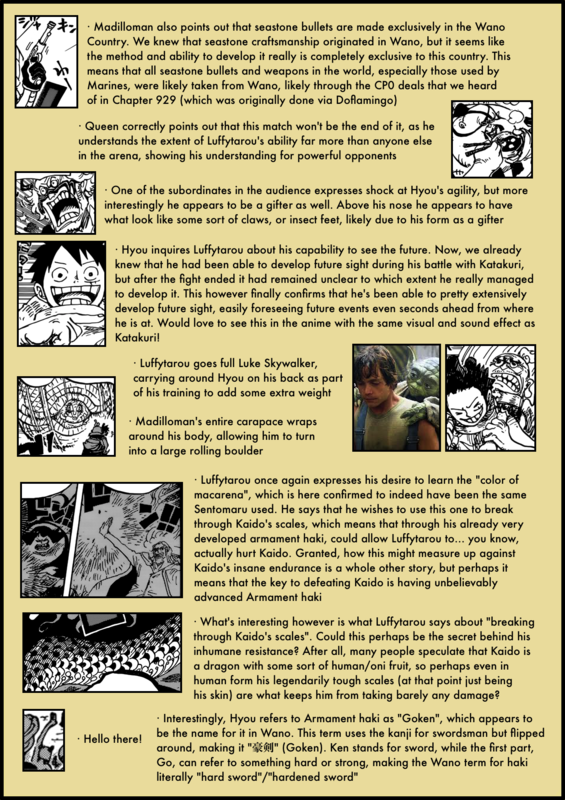 Luffy is spacielly good at using Kings-haki and if he awakens this ability he truly will be a scary figure in the world of One Piece. He truely will be a yonko level then. Thanks for another great analysis ! I don’t think Oda is retconning here. I think he’s more trying to fit the haki he overshadowed into what really became haki years later and that he probably didn’t think through at that point in the story (kind of the same he’s doing with Sentomaru’s technique in Luffy’s side of the story). For me this also highly suggests that what Zoro displayed in Sabondy against the thieves and maybe even at Punk Hazard against Monet were traces of conqueror’s haki ! Being able to hears the voices of objects and to avoid falling rocks are the part of observation haki ability, not part of armament. 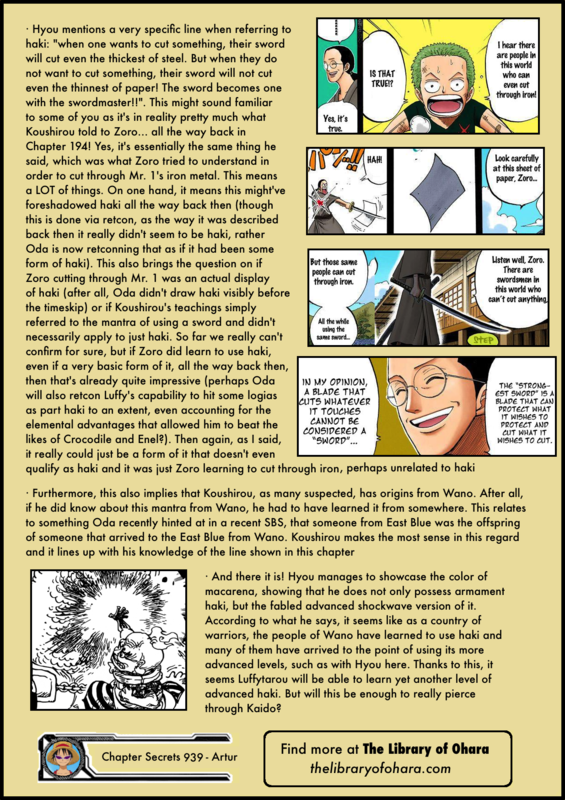 So actually zoro didnt use when he fought mr.1. 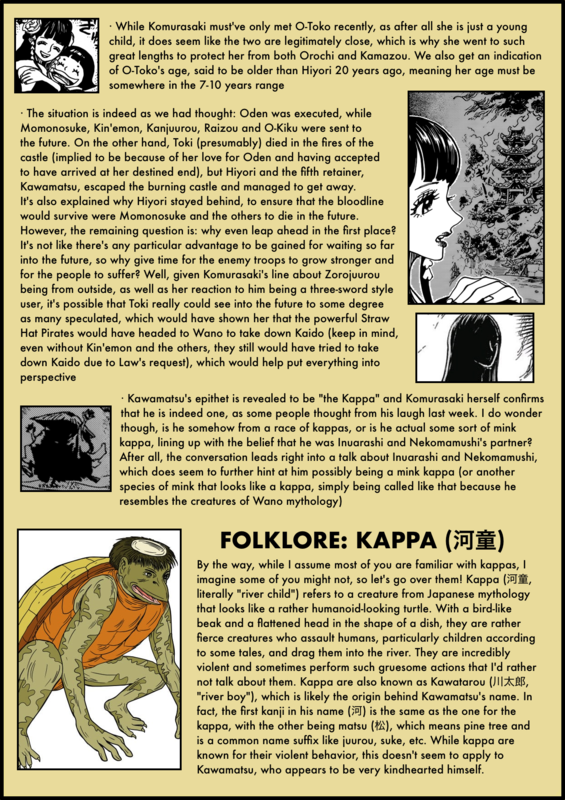 I’m leaning towards Kawamatsu being a user of the Kame-Kame fruit (turtle), model Kappa. But if he’s a demon fruit user, he cannot swim in the canal (see in the page 7 in the french edition – scantrad.fr) during the escape with Komurasaki. I wasn´t trying to campare an elephant to Kaido. I was pointing out that Jack in his elephant-form is WAY stronger then the elephant we saw in Ruskaina. if Rayleigh goes full power he can low-diff that elephant, no questions there. So if Luffy masters the same attack he might high-diff Jack given what we saw in Zou-arc (he won´t go down so easily because he took and survived Zunishas attack), this attack that Luffy is learning won´t be as devastating as Zunishas-trunk. so how can you defeat someone who is WAY above Jack in term power level. I couldn´t make sense of that and that is why i said that this advanced haki might not be the answer. If my logic or head-cannon is flawed, let me know. what do you even mean bud? On Chapter 920 I love Oden, page 16, i think… you can see Kawamatsu looking similar to a Kappa, behind Raizo to his right (left side of the image, down).